WW1 Reenactments Equipment : Great War Tommy WW1 Documents, Paperwork : Army Certificates of Education. 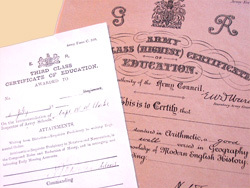 WW1 Reproductions and WW1 Reenactors Equipment / Kit - Army Certificates of Education. 3 different Army Education Certificates. First, Second and Third Class Certificates of Education (Army Forms C308, C309 & C310)E.R. Impress the Sergeant with your Arithmetic, Map Reading and Modern English History.